With the help of advanced computer technology, we’ll be able to design a plan that will shift your teeth into their best possible alignment. After we determine this plan, a series of aligner sets will be created. You’ll then wear the first sets of aligners for a designated period, making sure to leave them in for at least 20 hours per day. After the designated period is over, you’ll start wearing the next set of aligners. You’ll continue this process until you’ve worn all of the aligners in your treatment plan and you’ve achieved the straight and healthy smile that Dr. West has prescribed for you. A Discreet Look – The main selling point of Invisalign is that the aligners are completely clear, creating a sort of invisible braces. 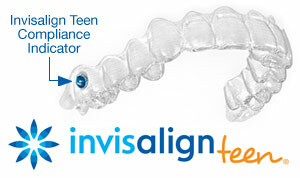 When you undergo orthodontic treatment with Invisalign, many others won’t even notice your orthodontics. Better Oral Hygiene – Because you can remove your aligners before you clean your teeth, your oral hygiene will likely be much easier than with braces. Cleaning your teeth with Invisalign is just the same as ever; with braces, it may be tricky to brush around the wires and brackets in the mouth. No Dietary Restrictions – While wearing braces, a patient will have to cut out hard foods and sticky foods because they can potentially break or loosen the wires and brackets. Thankfully, you don’t have to modify your diet at all with Invisalign – you simply take out your aligners and eat what you like. Extra Comfort – Invisalign’s aligners are made of soft, polyurethane plastic, which means that they’re more comfortable for your mouth than the metal brackets and wires of braces. As we previously mentioned, one of the best benefits of Invisalign is that you can just take out your aligners and clean your teeth in the same manner as you always do. Having said that, it’s crucial not to skip this part. You should to brush your teeth after every meal or snack so that food particles and plaque don’t get trapped inside your aligners, just as you would without braces. Over time, neglecting this important step can cause tooth decay and gum disease; therefore, make sure to clean your aligners regularly by brushing them and then rinsing them with lukewarm water to ensure that there is no buildup on the aligners themselves. Visit Your Lansing, Meridian, and DeWitt, MI Orthodontist!